Jorhat is sitting on a powder keg of epidemic diseases, courtesy the waste disposal system of Jorhat Municipal Board. Heaps of rotting garbage dumped at Garmur area of the town and seepage into river Bhogdoi near the area from where two drinking water supply projects, one of Jorhat Municipal Board and the other of the Urban Water Supply Board, supply water to sizeable population of the town auger ill for the people exposed to such contaminated water. Although the stench and filth have drawn the attention of Jorhat MP Kamakhya Prasad Tasa, who held a meeting with members of Upper Assam Chamber of Commerce here on Tuesday at their office complex at Seuni Ali here to find a solution to the problem, only time would tell whether any steps would be taken for a scientific disposal mechanism to be put in place as suggested by a few of the members. Anand Agarwala, a member of UACC, said that a compost machine could be installed at the place which would segregate biodegradable wastes from plastic. The biodegradable wastes could be turned into compost and the plastic recycled into bricks and used for laying roads or burnt in boilers as it is being done in some parts of India. “As the cost was very high, about Rs 5 crore, no businessman could afford to install this machine and this would have to be installed by the Government and someone from among us could run it on a PPP mode,” said the Jorhat MP. Tasa said that if it was profitable then he would suggest that the Jorhat Municipal Board could install and run it instead of giving it to any other agency. Agarwalla said that Rs 200 crore untied fund had been sanctioned to Jorhat on Wednesday and taking out Rs 5 crore for the purpose would go a long way in keeping the place clean as envisaged in the Centre’s Swachch Bharat Abhiyan. As it stands today nobody can cross that stretch without being overpowered by a nauseating stench. The road to the Garmur cremation ground cannot be accessed without stepping over garbage strewn all over the road. Inside the crematorium, the park like ambience of peace and serenity is spoilt by the smell. 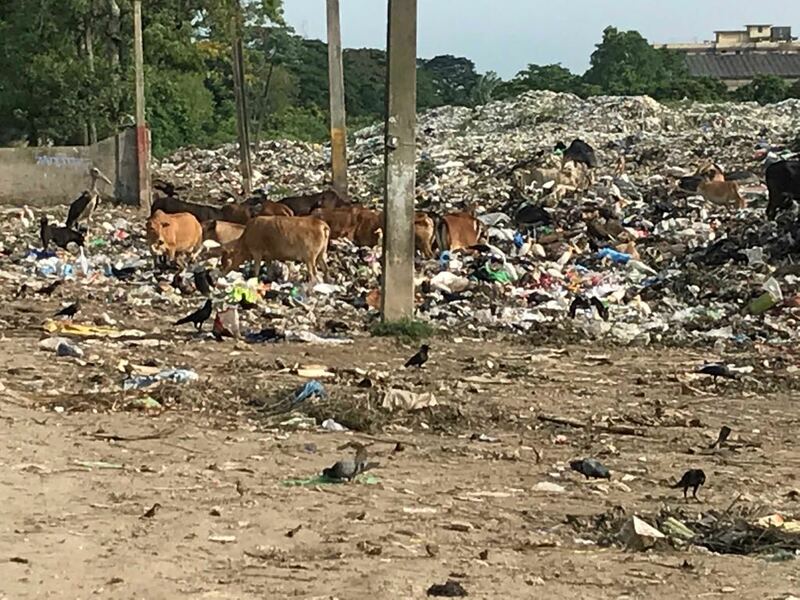 Not only the garbage, but rotten vegetables from the vegetable market near the area are thrown on a daily basis into a stream which flows into the Bhogdoi adding to the unhygienic condition of the place. The JMB plan to shift the garbage to another site at Panisokuwa also failed after people of that area stopped the trucks from dumping the garbage there a few days ago. Everyday sixty to seventy tonnes of garbage were carried by trucks at a huge cost and an equal amount of garbage is dumped at Garmur everyday by tractors and a number of mini trucks from different places of Jorhat. The JMB was accused of large-scale corruption in this fruitless exercise which did not serve the purpose of cleaning up the Garmur area. The Government should on an urgent basis test the waters of the Bhogdoi for contaminants to preempt a situation of outbreak of life threatening diseases.